ABC staffers called the cops after Chris Brown's tirade this AM to document the broken window in the building, and this could spell big trouble for the famous singer who is currently on probation. 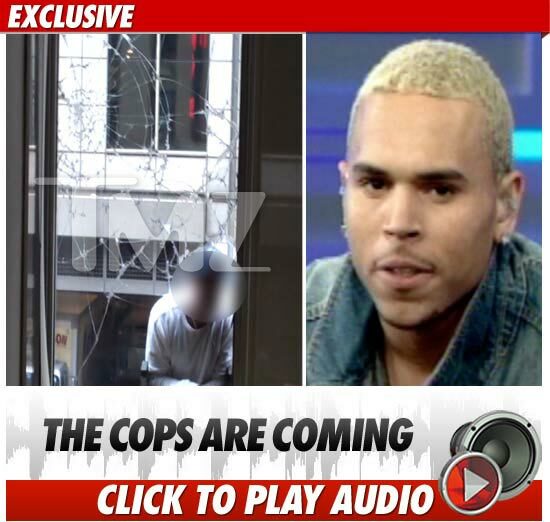 TMZ obtained audio near the dressing room where Chris allegedly took a chair and smashed a window, sending shards of glass onto 43rd Street. During the conversation between the staffer and a glass repairman, the staffer says "I have a police officer coming just to take a look at it before we do any work." Despite the conversation, NYPD sources tell us ... none of their officers were dispatched to the scene. If Chris did indeed smash the window, it probably constitutes at least 2 crimes -- vandalism and assault on the passersby below. As a result, the judge in the Rihanna battery case could revoke Chris' probation and, worst case scenario, he could end up in prison.